To provide a rational means to categorize (common cause vs special cause) and measure variation, Walter A. Shewhart invented control charts circa 1925 – 1931. W. Edwards Deming took these basic statistical concepts and tools with him to Japan after World War II and planted the seeds for the quality revolution. The rest is history. 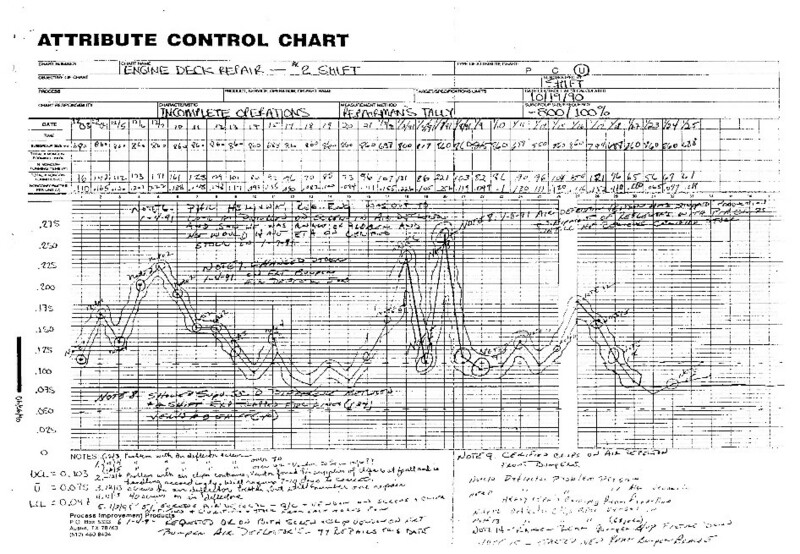 Control charts are best maintained at the job station by the production team to provide those closest to the process guidance on when and when not to take action. Once a process is in statistical control (a very fine achievement in itself), a control chart can verify actions taken to reduce variability. The primary signal of an out-of-control process is a point outside the control limits. Given constant probability (an requirement for process control), the chance of a point outside the control limits is very, very small. Other out-of-control signals include seven points in a row above or below the mean and runs of seven up or down. If these signals are present, then a special cause has visited the process. Look for it right away, before the trail grows cold! Here is an example of an X-bar & R chart for variables data. An assembly plant body shop was requiring significant overline overtime to make production and the management team was attributing the volume shortfalls to “catastrophic” breakdowns at its constraint. 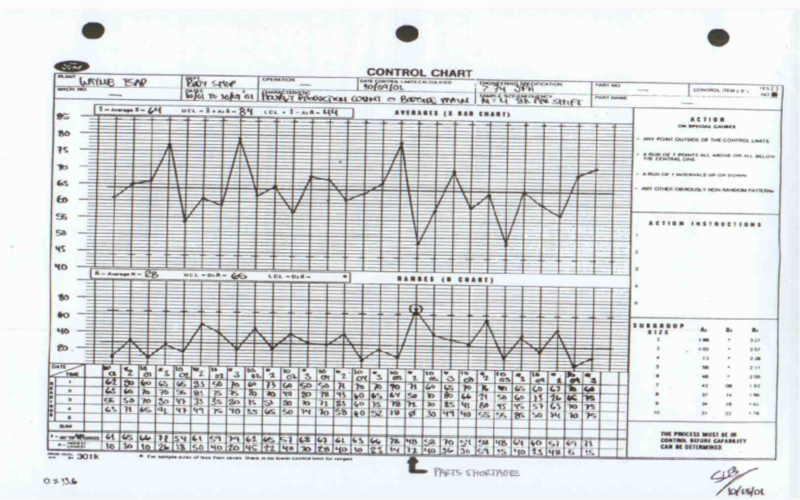 A control chart for hour-to-hour production counts was in control (no special cause events) but with an unacceptably high level of common cause variation. The management team was “recalibrated” to focus their effort on the many small production loss causal factors occurring every hour: speed losses, absenteeism, operator pacing, untrained operators, material deliveries, weld faults, tip changes, etc. Control charts also work with attribute data when variables data is not available. Here is an example of a U-chart of incomplete operations at an inspection and repair station. This chart has been out of control for quite awhile: the mean number of repairs have shifted up. In retrospect, the team was slow in finding the special cause in this case a defective bumper shield clip. Out-of-control signals can be good. Let’s say an adjustment has been made to a process running above the specification target. A run of seven points below the averages chart mean is verification that the adjustment has moved the process mean. Or maybe a material spec change has been made. A run of seven points below the range chart mean is verification that the material change has reduced common cause variation. In both cases, new control limits must be calculated to reflect the process changes.